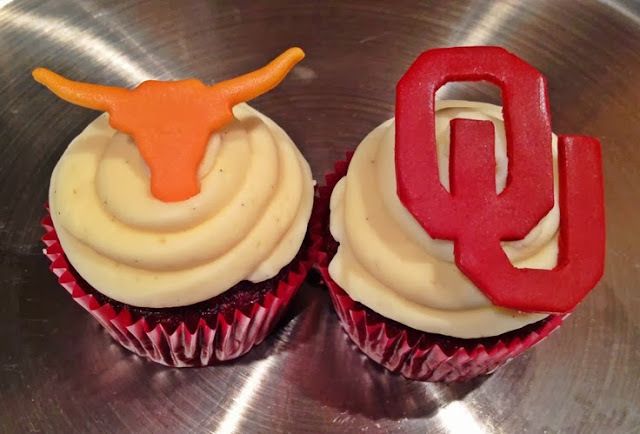 Any football fan living in the Dallas area is probaly going to partake in the Red River Rivalry game this Saturday. One reason this game is so much fun, is because it takes place at the Texas State Fair which is one of the biggest fairs in the country. Here are a few of my tips to make the day run smoothly. 1. Wear comfortable shoes. You will be doing a lot of walking. You will walk a good distance from the parking lot into the Fair and then when you get into the Fair. Fair Park encompasses 277 acres. It's big. 2. 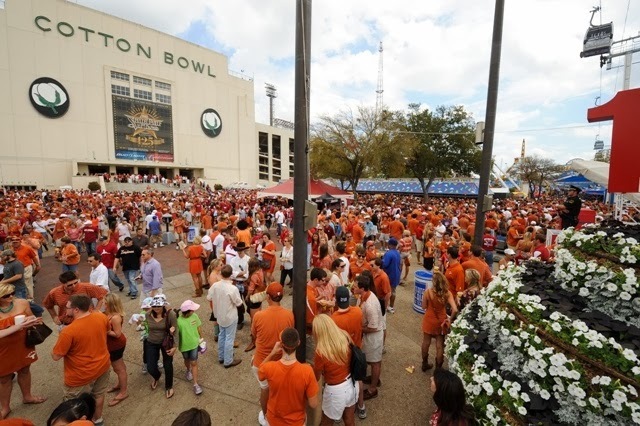 The Red River game is the perfect opportunity to wear your cowboy boots. It will literally be a sea of cowboy boots and dresses worn by all of the girls. 3. Indulge in some of the award winning fried food concotions. You only live once and then at least you can tell your friends you tried a fried oreo. I am looking forward to trying the fried nutella. Here is a list of the fried food winners and where they are located at the fair. 4. The weather is supposed to be a little rainy, 40% chance of rain. You may want to bring a poncho in your crossbody bag. 5. Make sure you take plenty of cash. There are ATM's at the fair, but the lines are always long. You need coupons to purchase any food or beer. Coupons are 50 cents each. If you don't have tickets to the game, there are plenty of great watch parties around town. Most bars and restaurants in Uptown will be holding their own Red River parties. Here is a list of some of the parties from D Magazine. Why It Makes the Top Ten: You just can’t miss this theater’s three massive screens, concert-quality sound, air conditioning, and $20 fajita plates made my in-house chef, Patrick Stark. Reserve your spot at txou@granadatheatre.com or 214-827-5514.
fried thanksgiving dinner, are u joking?! i need to go to this next year!